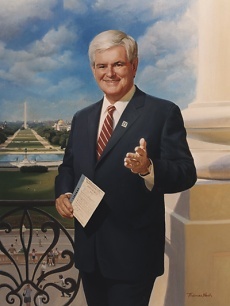 Recently it was suggested by an art critic who does not specialize in painting, that my portrait of the Speaker 'looks like it must have been done from a photo'. I really wish it were that easy. To begin with, I decided that Newt would be facing the viewer, with the Mall behind and the sunlight hitting his face. The sun had other plans. It couldn't shine through the solid structure of the capitol. Also, the column wasn't exactly where I needed it to be to line things up as I had in mind. The Washington monument is very tall and could have easily distracted from the portrait. 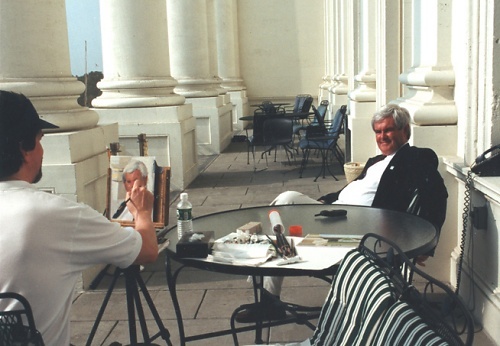 You can also see how much artistic license I employed with the perspective of the railing and the scene below. And of course, the color is never right in photos. 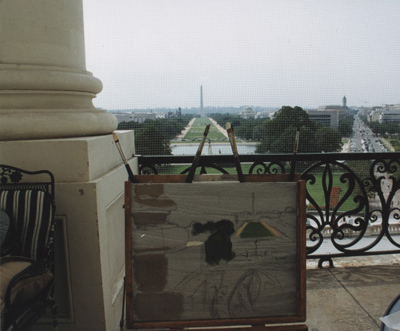 During the August congressional recess in 2000, I was able to spend the better part of three days sketching, painting and studying the view on the Speaker's balcony. 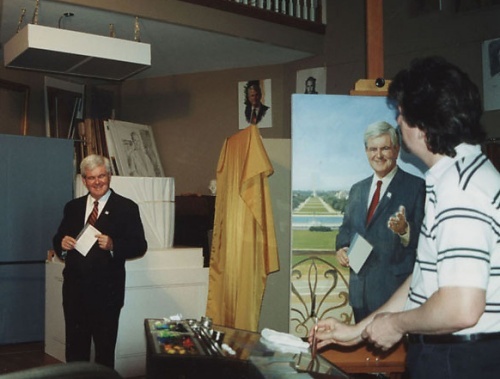 I knew I would not have another opportunity to work there before the painting was scheduled to be unveiled. I almost always begin with a small study in oil paint to familiarize myself with the colors of the face. At this point I am only interested in determining the colors I will use later to make it appear that Newt is standing on the balcony and the sunlight is striking him. Because the sun can't actually do that, at least not at the angle I wanted, I turned Newt around to face the Mall while I did this sketch. This oil sketch is not very far along at this point. I did it so that I could familiarize myself with the look and feel of the scene including the various trees and structures. It didn't matter that I planned to place the column on the other side of my painting I was primarily interested in studying the colors. I am using a small painter's box called a pochade box. Much more compact than my smallest easel, it is convenient to use when working out of doors. 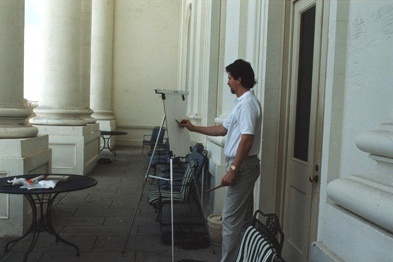 From this distant photo that my wife took of me painting, you can get a sense of the scale of the U.S. Capitol building and where the Speaker's balcony is. There is a large net to keep birds from flying into the building. There now is a 'window' in it that can be lifted to see out more clearly. I rolled this up while I painted. During much of the time I spent on the Speakers balcony I sketched and figured how I would compose the picture. I wanted at least a part of one of the columns to show because they are such a characteristic part of the balcony. I felt that the view of the Mall was best if it was symmetrical and not seen at an angle. I also wanted to include the Smithsonian's Museum of Natural History without it being blocked by the Speaker's shoulder. I also wrestled with the perspective in regards to the railing and where it would intersect the view below. There was a lot to juggle, a lot to reconcile. In the end it was necessary to invent much of the painting. In doing my homework before beginning this project I read a paper the Speaker had authored called 'The Age of Transitions'. It contained a diagram with three 'S' curves. I thought I would attempt to work this pattern into the portrait if possible. This is the diagram and the box formed by the two current 'S' curves. 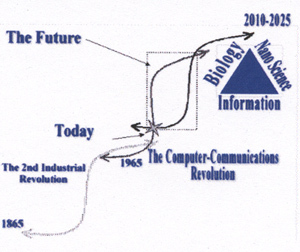 This shows the 'Age of Transitions' diagram laid over the painting. I arranged it so that the Speaker's head would be in the center of this pattern because this is something that he is very knowledgeable about. The old iron railing corresponds with the part of the 'S' curve that describes the early days of the industrial revolution. 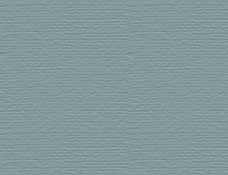 Other portions, like the sleeve and shoulder are less related in terms of content. The last portion of the third 'S' curve is in the clouds, a traditional symbol of the future. The challenge I faced was making sure that it didn't look forced, that the clouds didn't look obviously placed there to create a shape. 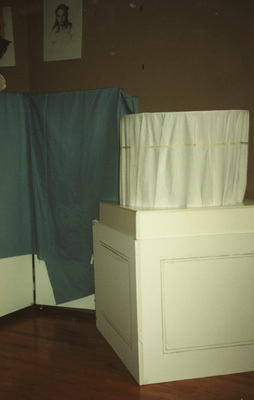 To help me determine the light and shadow that would appear on the base of the column and how the shadows would fall when the Speaker stood next to it, I built an exact scale replica in my studio out of canvas and other materials. 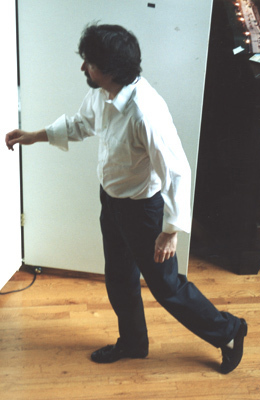 At the time this photo was taken in my studio, I was considering different positions for the left hand in the painting. 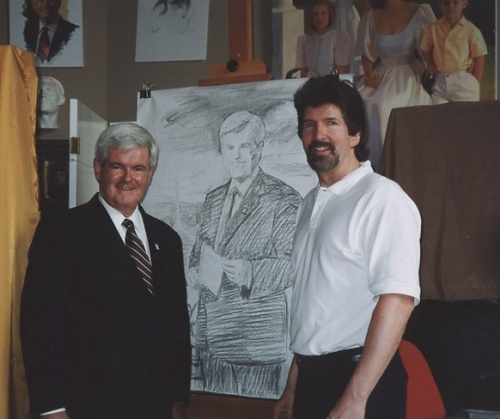 This is evident by the full-scale charcoal drawing behind us. I made many of these as I worked out my compositional ideas. I would later decide to have the Speaker gesturing as he often does while speaking. I arranged a very large light fixture to emulate the sun. I left the north light drapes of my studio open just enough to light the canvas. At this point there is still much to be done on the painting. The mall and sky and Newt's suit are only blocked in. 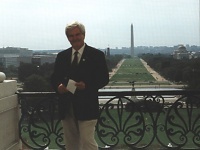 I have yet to add any people down in front of the Capitol or on the Mall itself. One final fun note. 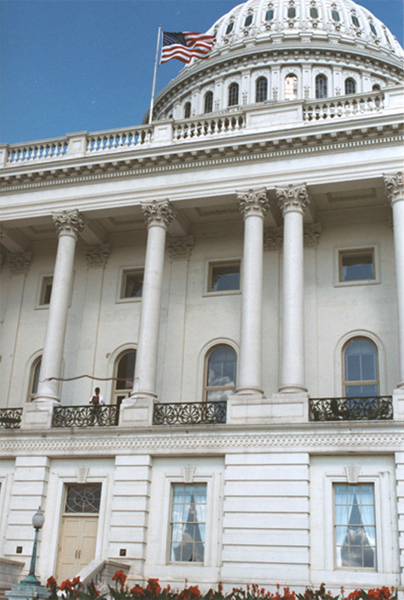 Most of the people who gathered in front of the Capitol during this project were waving and smiling at the Speaker and looking directly up towards the balcony. I needed more people to just be walking by to make the scene more typical of a day in Washington. I had my wife take a snapshot of me from the balcony overlooking my studio. Using that I painted a rough approximation of myself into the Speaker's portrait. You can just see it down at the bottom. This was the photo I referred to.